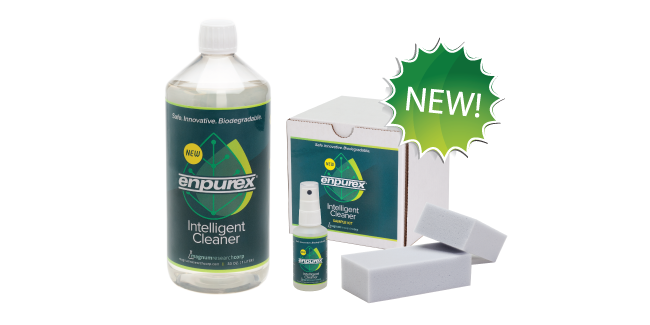 Enpurex is a breakthrough new cleaning technology for removing label residue from surfaces. Deploys smart structures that vibrate 4,000 times per second as they break up and work their way beneath stuck-on labels, adhesives and inks. Patented micro emulsion technology detaches layers of residue and coatings from the surface to be cleaned instead of dissolving them like other cleaners. Green, water-based and pH neutral. Removes label residue from stainless steel, plastic and Lexan surfaces, such as labelling machine conveyor belts, quickly and effectively. Safe for workers. Can be kept out on the plant floor. Contains NO organic chlorine compounds. FOR PHARMACEUTICAL AND NUTRACEUTICALS LABELLING OPERATIONS: Enpurex removes label residue from labelling machinery and conveyor belts quickly and effectively. FOR FLEXOGRAPHIC PRINTING OPERATIONS: Enpurex gently lifts all ink from anilox rollers. Effectively cleans solvent- water- and UV-based inks like never before. Spray a small amount of Enpurex® (3-5 pulls with the spray trigger) on one of the Microfiber Cleaning Pads provided. Massage Enpurex® into the surface to be cleaned. Wait 1-2 minutes, letting the vibrating structures do their work. Wipe the surface with a water-soaked rag or towel. This deactivates the vibrating structures and completes the cleaning process.